Are you pruning your Hibiscus, Crape Jasmine (Nandiyavattai) , Nochi, Jasmine and Adathoda plants? Do you have numerous tiny saplings of tulsi and lemon growing all over your backyard? Are your Aloevera, Cissus( Pirandai) and Oregano (Karpooravalli) plants growing wild? Do you have more banana saplings growing than you can accommodate in your little garden? Do you have organic seeds of traditional varieties of vegetables and fruits lying in your cupboard? We know how it feels when you neither have the heart to throw them away nor know what to do with it. Here is what you can do: You can bring them and any other useful plants and seeds which you have to our little plant-giving mela and experience the true joy of giving. 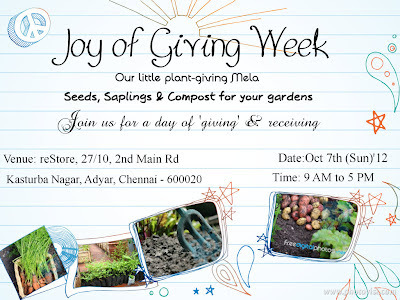 Do you want seeds, saplings & cuttings for your garden or to gift someone? Do you want compost to feed your plants? We will have plenty of them too! Just bring some rakes, spades and sacks and get ready to dig into our huge compost pile and take home some yummy food for our plants! This is neither a sale nor an exchange. This is a day for giving without any expectation in return and receiving with gratitude. This would also be an opportunity to connect with fellow gardeners and make new friends. You can learn more about reStore gardens here.